As a lover of Tarot, each year I calculate my year card to see what energies will prevail in the upcoming year. Because my birthday is in February, I figure the year from January to January (close enough), so in a couple of weeks, my new challenges will begin. The year 2016 card for me is The Chariot. According to one source, the card means deeper spiritual understanding. As a year card, it means change in location, career, family, and opportunities: a year to focus and harness one’s energies. I can accept this challenge. I tend to be a butterfly, first one thing and then another, and the housework doesn’t seem to get done often. Procrastination is one of my basic activities (or non-activity as the case may be). While I have many ideas, putting them into the world is another thing entirely. I miss more than I want to for lack of preparation. Now that the energies are aligning for me, I have hope that I can become more active in the outward world rather than in my mind. I am making a list of what needs to be done and what I want to do on a yellow legal tablet, hoping to be able to cross off items on a daily basis. So I’m back and the question is, what am I doing here after a hiatus of over 2 years? Where was I and what was I doing? Nothing and everything, I’d say, if you forced an answer out of me. When I began this blog as my cleoxcat persona, I asked myself how personal I wanted to get, how much to put out in the blogosphere – the Net, that telephonic black hole which everyone understands and no one can explain. What could I say about my life without giving away the goods? Or even partially. If you don’t get personal, you don’t connect. I know that because I love a good story or a good gossip or some tidbit I can relate to. Was it me or was it you that life happened to? Ok, ok, so maybe this is a bit schizophrenic, but then, if you don’t have more than one personality, life can be a bit boring. Nothing to watch or see here. Nothing to see… so move on. But I came across an exceptional photo of a glass aspect into the forest, featuring a bed, roots, windows, and woods – all of which can be symbolic if you take yourself seriously (which I rarely do). “Are we being dreamed by a single divine intelligence, by God, or are we being dreamed by the collective consciousness of all things — by all the electrons, Z particles, butterflies, neutron stars, sea cucumbers, human and nonhuman intelligences in the universe? “We cannot ask if the part is creating the whole, or the whole is creating the part because the part is the whole. So whether we call the collective consciousness of all things ‘God,’ or simply ‘The consciousness of all things,’ it doesn’t change the situation. “The universe is sustained by an act of such stupendous and ineffable creativity that it simply cannot be reduced to such terms. Waking up in a place like this, so open. Is it terrifying, where anything can happen or freeing, where anything can happen? The answer to that question determines how you live your life…in beauty or in fear. So where do we go from here? I, for one, am tired of worrying about the world. I think I’ll just decline to frown and suffer, and instead, offer up a prayer for the well-being which always surrounds us. No apologies for my momentary distraction, just hello world, I love you and hold you in my heart. Finally a sunny day after what seems to be months of clouds, grayness, dampness, and general gloom making me feel as if I need double energy just to get by. Called outside by the brightness today, I squished my way around the yard looking for any signs at all that we might actually experience Spring in the future. 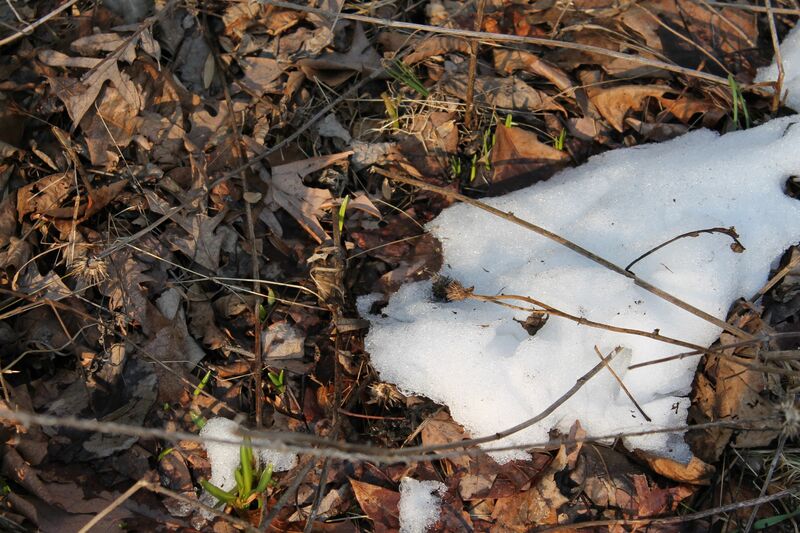 There, tucked among patches of snow, my eye was caught by green: the slim leaves of snowdrops growing through last year’s debris into the light. Green, the color of life, a spark among the brown leaves. I read somewhere that it is not the sun’s light that calls forth plants from the earth, it is instead, the heat of the earth which starts the growing process and urges the plants to unfurl and expand. So the sun, which started its northward climb on December 21 has had its effect in heating the earth just enough to start the changes that will blossom in April. February 2, Groundhog Day, Brigid’s Day, Candlemas, Imbolc, is the cross-quarter day when one can begin to see the lengthening of the light which began at the winter solstice. The sun’s rays, lengthening to warm the earth. In my sun room, my plants begin to show new green and I know it’s time to give them fertilizer and more water and in a little while, take some cuttings to start new plants. The insistent vibrancy of spring helps them root and grow, and in the summer, bloom. Time later for action. Right now I think I’ll just rest, feel green, and put out new roots myself. I’ve written before about my favorite dream shaman, Robert Moss, and he’s the one I turn to when I need a deeper insight into one of my dreams. The above quote is what I found when I went searching through his Dream Gates blog for pieces he’d written about encountering departed friends in dreams. It does not quite touch on my experience, but it’s a kind of verification that what I experienced I actually experienced, albeit in a different level of consciousness. A few days ago I awoke feeling languorous and as if I’d been relaxing in, no, rolling in, green, the green of spring, of freshness, of fertility, the color of pleasure. Closing my eyes, I opened my inward eye to try to recover my last dream of the night (early morning actually) and realized that I’d been wrapped up in, embracing, an old friend who left the physical world quite a while ago. We, he and I, were stretched into each other as if our very molecules were blending, shapes shifting, drifting in, sharing bliss. The totality of the dream fragment was this simple encounter. Now this is not a friend I dream of often, so I pondered what could be the meaning of this melding. Was I embracing my inner animus? Was I simply relaxing myself, releasing stress, healing myself in a dream fragment? I think the answer is neither of the above. Previous to going to bed the night before, I had been cleaning out old emails and found one from a very long time ago (transferred across several computer upgrades) written about him by another friend. I read through the message, remembering the times she spoke of fondly, and then finally erased the message with only a pinch of regret. I think somehow my picturing him in my mind sent out a psychic vibration into the layer of consciousness where he is now, and he dropped by to visit me. And, given his affection for me, he embraced me for a while, allowing me to sense him and say hello in return. Sometimes I’m not sure what I believe about parallel realities and “other worlds.” Do the dearly departed walk among us in another level of vibration most of us can’t see? If we do sense a presence, is it a thought-memory or the personality? To explore such ideas and puzzle out the nature of reality (if anyone really can) is a pleasure I can’t get enough of. An addiction to looking for ghosts of all sorts? Hmm…. Appropriate that I should write the first post of 2013 and include a picture of a suitcase. Oh, and a cat. In this past November my husband made me a gift of a Canon EOS Rebel T3 digital camera to replace the Kodak Easy Share digital camera I’ve had for a couple of years. I’ve been wanting to upgrade for quite a while now, so the gift was a wonderful treat. However, the Canon has a myriad of settings and functions and comes with a large basic instruction manual plus a CD with more information. Yikes! So I decided that I would challenge myself to taking a photo a day using my new camera and its settings to force myself to learn what I can do with it. This led me to create another blog, A Daily Photo in 2013. Not an exciting title, but gets the job done. So far, so good. I’ll be posting lots more on that blog than this one, but intend to write here what doesn’t exactly fit into the photo-a-day theme. That’s our tabby cat, Rocky. He’s about 3 years old and very active. His daily routine is up early, breakfast, a quick check of spa room and entry, cellar, bird feeder window, upstairs bedrooms, then kitchen food dishes, then a nap. The rest of the day, repeat. This photo was taken when our son Steve came to visit over the holidays and left his suitcase in the entry hall. Before he could take it upstairs to the guest room, Rocky claimed it. I have to admit I’m a sucker for cute cat pictures. A quiet end to the year 2012 at my house. Our holiday party set for this past Saturday was snowed out, so we moved it to yesterday. Warm friends, lots of talk, laughter, celebration. Now the aftermath awaits me in the form of dirty dishes, leftovers, and the neglected washing from last week. A quiet day for me, almost a meditation, as I put my house and my thoughts back in order. Plans for 2013 taking shape in my mind while my hands are busy. Looking out the windows at the snow-covered forest and feeling one with the cool gray and whiteness. Lots to do while I move in peace. A full day ahead of cooking, eating, opening presents, and socializing. Remembrance of things past as this day will become tomorrow.